Multilingual Books is happy to announce a special package for young children learning French, German, Italian, or Spanish! We are offering Little Pim, an award-winning foreign language immersion DVD series for babies, toddlers and preschoolers, with 3 theme-based DVDs that use a unique Entertainment Immersion Method, which combines animation and real kids, teaching simple words and phrases for everyday activities; Language For Children book and CD course series, with a book, 2 audio CDs, and a Parent/Instructor CD, featuring catchy songs and the humorous adventures of SuperCat to captivate the child's imagination and foster language acquisition; Vocabulary Builder, an interactive flash card system on CD-ROM to teach children basic language with numerous games and activities, with help provided by a talking tiger; Talk Now, an entertaining self-study course to learn basic phrases, such as colors, numbers, food, shopping, and time; World Talk, the perfect follow-up to EuroTalk's popular Talk Now! series, with new activities, dictation, worksheets and a brand new recording section, including topics such as the calendar, sentence building, asking directions, the weather and numbers. Save $$ over buying these items separately! 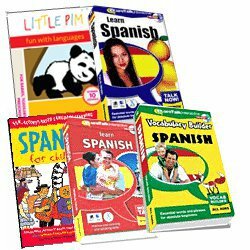 Multilingual Books is happy to announce a special package for young children learning French, German, Italian, or Spanish! We are offering the Language For Children book and CD course series, with a book, 2 audio CDs, and a Parent/Instructor CD, featuring catchy songs and the humorous adventures of SuperCat to captivate the child's imagination and foster language acquisition; Vocabulary Builder, an interactive flash card system on CD-ROM to teach children basic language with numerous games and activities, with help provided by a talking tiger; and the Language Tree DVDs, a breakthrough way of teaching languages, incorporating a unique Multi-Cognition Approach� developed by a Stanford cognitive scientist, together with proven language learning techniques. Save between $25 over buying these items separately! Meet Little Pim, a charming animated panda who guides babies, toddlers and preschoolers on a fun-filled journey to learning a foreign language. Little Pim only speaks in the foreign language, while interacting with babies and young children enjoying everyday activities. We encourage you to watch Little Pim with your child and join the onscreen fun by calling out words and repeating the language together. Because Little Pim focuses on the first words typically acquired in a kid�s vocabulary, your family can reinforce the lessons by simply repeating the new language during your everyday routines. Studies show that exposing young children to a foreign language facilitates fluency later in life and could also enhance cognitive abilities. Created by Julia Pimsleur Levine, an award-winning filmmaker and mom, Little Pim is a groundbreaking kids� language DVD series that offers hours of fun while providing the basic building blocks for learning a foreign language. This multi-disc series of 35-minute DVDs can be viewed in any order, with each DVD teaching 60 words of vocabulary. Special features include: 5-minute episodes to facilitate pausing for interaction; vocabulary review after each segment; optional English subtitles; parent guide with helpful viewing and learning tips. Comes in three DVDs: Eating and Drinking: follow Little Pim and pals as they wake up to a new day and go to sleep after a busy day; Wake Up Smiling: follow Little Pim and pals as they wake up to a new day and go to sleep after a busy day; Playtime: join Little Pim and pals in the wonders of play, from blocks to boats to tea time. Vocabulary Builder is designed to meet the requirements of children aged 5-12 years old. It combines pictures, text and sound to make an interactive vocabulary building system which parents and teachers can use to help on basic language teaching. Children can use this disc to learn words, play vocabulary games and record their own words and sentences. Although aimed at children, Vocabulary Builder has also proved popular with adults trying to score their own gold award! The demand for further languages based on this highly successful title (now available in 30 different languages) was something that could not be ignored and additional help by an an animated tiger who now speaks over 40 languages has proved even more popular. Play interactive games like Find The Card, Match The Pairs, and Beat The Clock; learn vocabulary with an interactive film strip in such categories as Common Vocabulary (A, B and C), Colors, Plurals, Professions, Actions, Positions, and Places; or record your voice and match it against the native speakers! All the while your child's progress can be tracked, and a printable version of it can be shared with teachers and parents. And if help is needed, just click on the talking tiger and he'll explain how everything works, all in the native language of the user! The Talk Now! series is for any language beginner who wants an entertaining self-study course to learn basic phrases, such as colors, numbers, food, shopping, and time. We have been selling this European-produced CD-ROM for a few years and find that it is highly praised by people from all over the world. Designed by language experts, Talk Now! includes great features like speak and repeat, interactive games, and digital recordings with native speakers. Interactive and fun, it is ideal for beginners and travelers. Test your knowledge with easy and hard quizzes and play a challenging memory game. Monitor your progress: keep your total score and print your own awards. You can also print your own picture dictionary for handy reference. On-screen help is available at all times in over 50 languages. Talk Now! runs on both Macintosh and Windows. World Talk is the perfect follow-up to EuroTalk's popular Talk Now! series. As well as having new activities, there is also dictation, worksheets and a brand new recording section. Topics covered include: the calendar, sentence building, asking directions, the weather and numbers. The interactive TV Quiz is a definite hit, where the resident champion may turn out to be more intelligent than he looks. You can also compete in a one-to-one match with a friend!